You’ve probably figured out by now that here at The Lotus and the Artichoke, I love world cuisine. The majority of my recipes are inspired by my world travels to far-off countries and enthusiastic experiments with ethnic cooking. Once in a while, however, I crave some good, old-fashioned comfort food. For me, that means a classic dish from the country where I spent most of my growing up: America. For breakfast and brunch, I’m a pancake kind of guy. But when I’m hungry for a more savory, lunch or dinner bonanza, the totally vegetarian T.L.T. is the way to go. But, but… what about Mac & Cheeze?! Sure… there’s that too, but sometimes it’s just gotta be a sandwich. This particular dish really takes me back to the old days of diner deliciousness. You’ve probably heard about the classic B.L.T. – Bacon Lettuce Tomato sandwich, but today I want to share with you a healthier and even tastier, more compassionate spin on that: The vegan T.L.T. 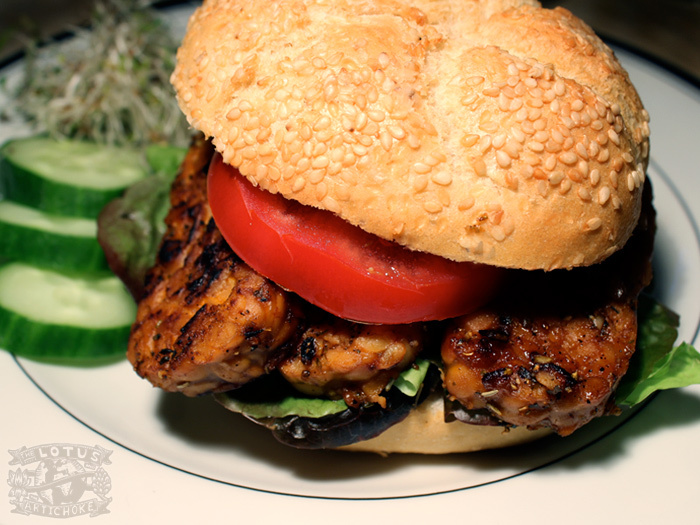 – Tempeh Lettuce Tomato sandwich superstar. I’ve tried a lot of veggie B.L.T.s at vegetarian-friendly diners around America, including the amazing Friendly Toast in Portsmouth, New Hampshire. Once I even drove my Vespa scooter all the way from Boston just for an unforgettable meal there. Unfortunately, the diner trend has been slow to make its way to Germany, and I’ve turned to making the classics in my own kitchen. There is one restaurant in Berlin that scores high taste marks for nostalgic veggie dishes – especially with their veggie burgers. Alas, they’re on the other side of town. If you know Berliners, you know we residents are hard to yank out of our chosen Kiez (neighborhood). This is a quick vegan recipe that you can whip up in about an hour, depending how long you choose to marinate the tempeh. I pan-fry the tempeh bacon rather than bake it in the oven (as many vegan cookbooks demand) to speed things up. You get a quicker meal – with all of the taste and flavor. Who wants to fire up the oven in the summer? Not me! This tempeh marinade is similar to the one I use for other tempeh dishes, like my Japanese Orange Tempeh Teriyaki. 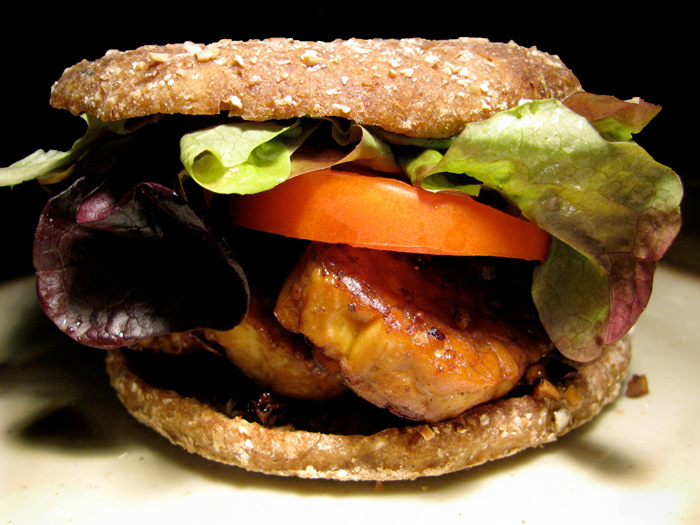 Actually, it wouldn’t be a stretch to call this a barbeque tempeh sandwich. Slice the tempeh thinner and you can get crispier “bacon”… or cut the slices thick for more of a BBQ veggie burger thing. If you want more of a thicker, tomato-y barbeque sauce flavor, add a chopped tomato and 1 tspn paprika to the marinade. Remember this great dish if you want to show some skeptical omnivore friends or family how delicious and satisfying vegan, plant-based eating is! Hey, maybe you’re the newbie or just having fun on a Meatless-Monday. Welcome to the party! Serve this up with some homemade french fries or sweet potato fries and pickles… and get ready to pass on the recipe! What diner classics do you dream about? Mix all marinade ingredients well in a medium-large frying pan. Cut tempeh into approx 1/2 in / 1 cm slices (3 or 4 pieces for each sandwich). Coat strips on both sides, marinate for 40 min, turning slices after 20 min. Heat pan with tempeh+marinade on medium-low. Bring to simmer, cook partially covered until marinade is about half gone, about 10 min. Flip slices, fry until all liquid is gone, tempeh slices are golden brown, slightly charred and crispy, about 5-10 min more. Arrange lettuce leaves, braised tempeh, and tomato on bread and serve! Use 1/4 cup of apple juice instead of water for more flavor. Add sprouts or salad greens to boost the raw factor. Some like it hot: Add 1/2 tspn red chili flakes or a small, chopped red or green chili for the marinade. Grilled TLT: Spread sandwich bread slices with vegan margarine and fry until golden brown and toasted before assembling. This entry was posted in American, American Comfort and tagged comfort food, diner, lettuce, recipe, sandwich, tempeh, TLT, tomato, vegan. Bookmark the permalink. I love tempeh bacon a lot! This is one tasty & awesome looking sandwich! :) Waw! I also loved your vegan lassi because I have made it! You made the vegan lassi? With saffron? Cool!